When summer?s scorching heat reaches its peak, few foods are better at keeping you refreshed and hydrated than watermelon. Make sure to use plenty of this vitamin-packed summer fruit during the height of its season, July and August. Seedless watermelon has become more and more common, sparing you from removing pesky pits one by one. Chill the watermelon for a few hours if you buy it at room temperature, since that?s how it tastes best. There are few beverages more hydrating for summer?s hottest days than a fresh watermelon slush. This semi-frozen Watermelon-Strawberry Slush, at top, will keep you cool and refreshed. In this simple Watermelon Slushy, pineapple and watermelon combined are sweet enough so no extra sweetness is needed. Watermelon-Cucumber Cooler combines two of the most refreshing ingredients around. It?s perfect as an everyday summer drink, and according to its creator, is a great cure for hangovers, too! Basil actually enhances the natural flavor of watermelon, as you?ll see in this tasty Watermelon-Goji Berry Juice. You can choose to either blend the soaked and plumped goji berries into the final drink, or leave them whole as juicy little morsels. Watermelon Pizza just might be the healthiest) ?pizza? ever! 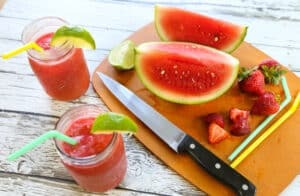 Kids love […] The post 10 Cool and Refreshing Watermelon Recipes appeared first on VegKitchen.